Thank you for stopping by my online portfolio. Now, you may be thinking, "A whole website? Man, this girl must take herself really seriously." 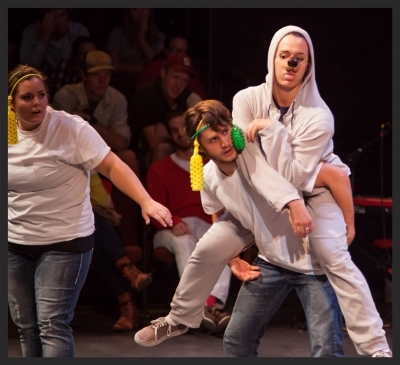 Just to go ahead and nip that assumption in the bud I will present a picture of me playing the character "Robot Dog" in a sketch comedy show with The Boone Street Hooligans. Great. Now that we have that all cleared up let's get back to it. This website is, in my mind, the easiest way to display and highlight some of my favorite events and most notable passions. In a sense it's my online résumé with some funnies in between. So go have some fun! I certainly did. Acting headshots can be found in the About section. Just sayin'. The Boone Street Hooligans is a student led sketch comedy group from Gonzaga University in Spokane, Washington. All of the sketches are student written, directed, and performed with all proceeds going to a local charity.